Angel Vergara is not a painter in the classic sense of the word. He became known through his performances as straatman (streetman) when he was drawing hidden under a white sheet what was happening around him. Since then, he created painted films and staged the act of painting in various ways in his pictural production. 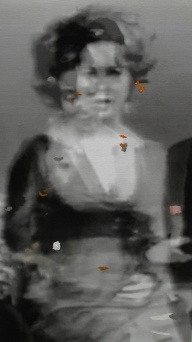 Almine Rech presents in Brussels until 29 September 2012 a new solo show of his new project. For the Almine Rech exhibition, Angel Vergara paints on images drawn from the media after he first edited and assembled them. Those images are the starting point and the frame serving his act of painting, aiming at enabling images to regain their colour, thickness and consistency they may have lost. The visitor is offered a “painterly journey” in the gallery staged by the artist himself and which presents his emancipated approach to painting.